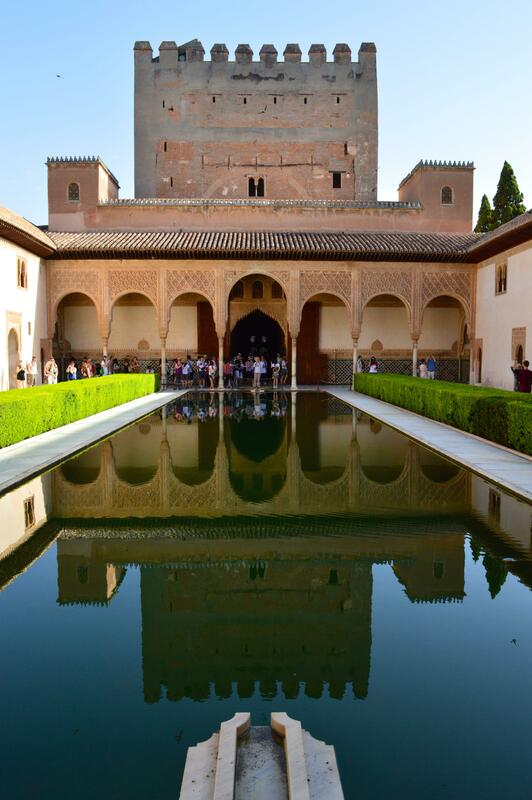 Scheduling a visit to the Alhambra is on any and every "Top Things to Do in Spain" list. Located in the heart of Andalusia, boasting magnificent views over its hometown of Granada, the 14th century palace and fortress certainly owns up to its fame. In 2014, the site welcomed over 2.4 million visitors, making it the number one visited monument in all of Spain, surpassing even the Sagrada Família in Barcelona. Let me show you why it has become such an acclaimed monument. If you're like me, you may be thinking: "But I've seen one Moorish castle, I've seen them all". In fact, it wasn't until my friends and colleagues living in Spain had told me I'd be seriously missing out on one of the most important, most beautiful, and most historical sites in all of Europe if I skipped a visit to the castle, that I booked my tickets and planned to spend a weekend in Granada. And it wasn't until I spent my own four and half hours at the site, that I must concur: you really should visit the Alhambra. Though the exact origins of the Alhambra are still up for debate, the oldest records of its use date back as far as the 9th century, when it was used solely as a military fortress. 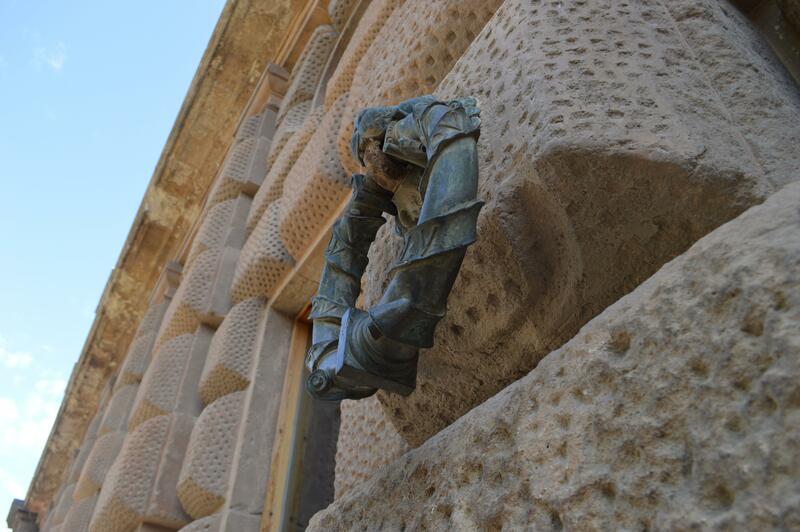 Not until the 13th century did the construction of the palace commence by the Nasrid dynasty. The royal family took up residence in the beautiful palace and stayed there until it was eventually taken over by the Catholic Monarchs during the Reconquista in 1492. 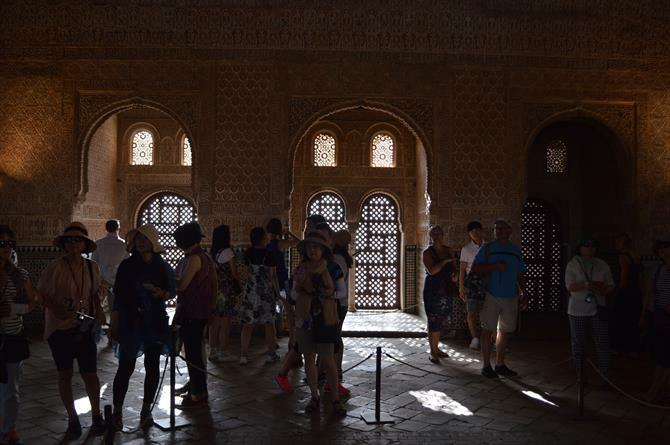 Hundreds and hundreds of years of history have passed through the walls of the mighty Alhambra due to its ability to withstand the tests of time and war. The palace has undergone several restorations, and is still a work in progress. 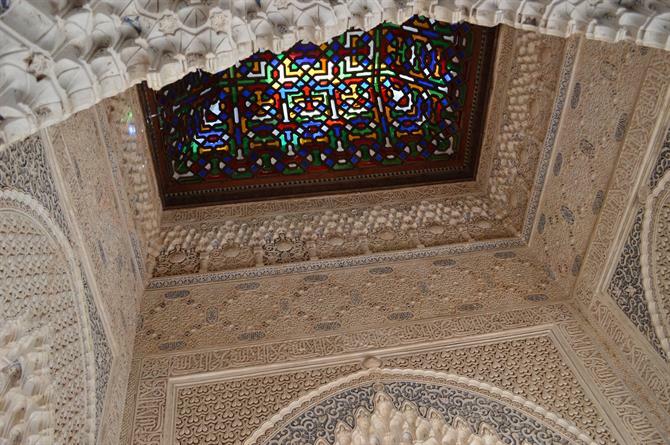 After a long, stagnant period of neglect spanning across more than 100 years, the Alhambra was declared a national monument in 1870 and restoration work began once again. Much of the original tiling and colours were lost through explosions, war, and redesign. 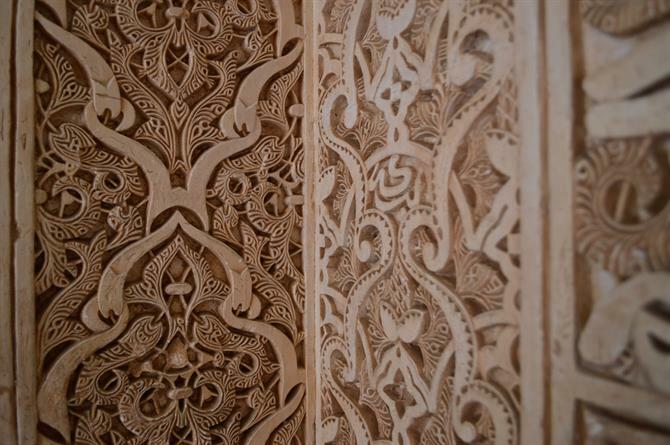 Archeologists and restoration teams are continuously studying the history of the building, with hopes that they can better replicate the original Arabic designs as well as learn more about its origins. In 1984, the Alhambra became a UNESCO World Heritage Site. The exterior of the Alhambra may not be as recognizable to you or I as, say, the Taj Mahal, but the real enchantment is found within the walls of the palaces. (Fun fact: it is believed that some of the architecture and design found in India's Taj Mahal was replicated from the Alhambra). Archways, Arabic calligraphy, fountains, greenery, stained glass, marble floors, intricate tiling, and mythical statues together create the elegance and ambiance that is felt whilst walking through the ancient royal residence. 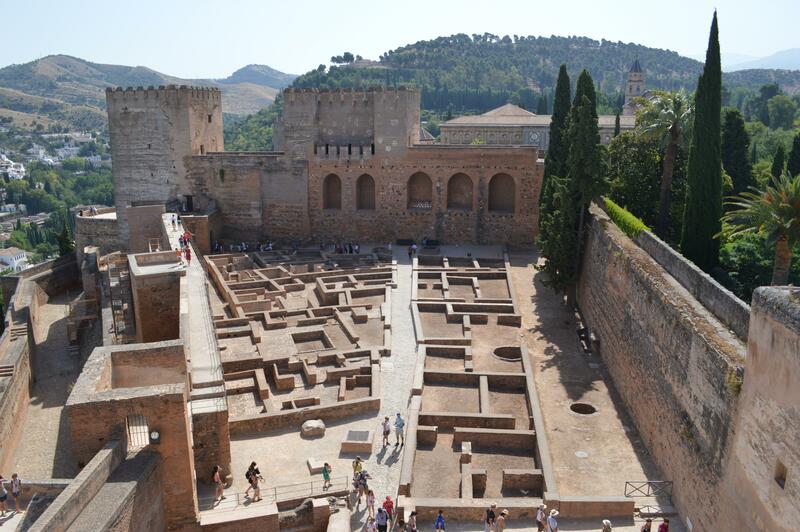 The mighty towers and thick walls that can be distinctly seen from the lower city center of Granada make up what is referred to as the Alcazaba. Here, you can catch unbeatable panoramic views over the city and the Sierra Nevada mountains, designed as such so the ancient Moors could easily keep a lookout for enemies and threats in the surrounding areas. 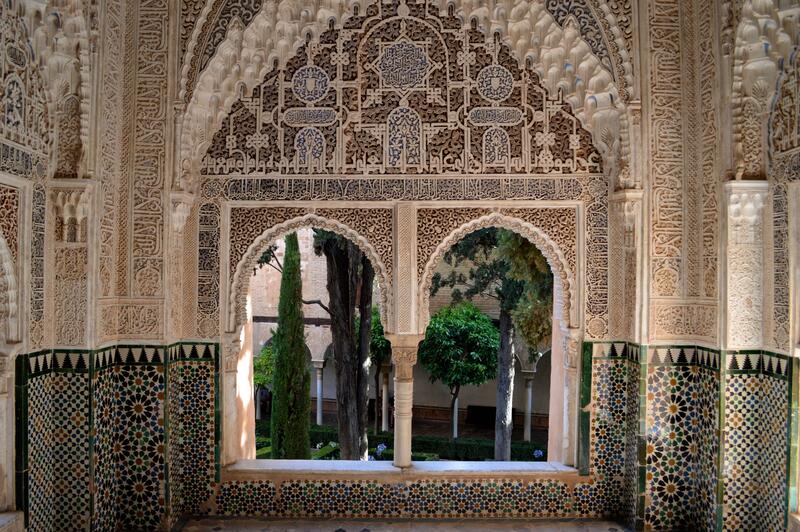 It is believed to be the oldest part of the Alhambra, dating all the way back to the 9th century. Across the centuries, the fortress has been primarily used for military purposes but also as royal residencies, a prison, and more. The Charles V Palace is located between the Alcazaba and the Nasrid Palaces, and was built in later years by the Catholics. 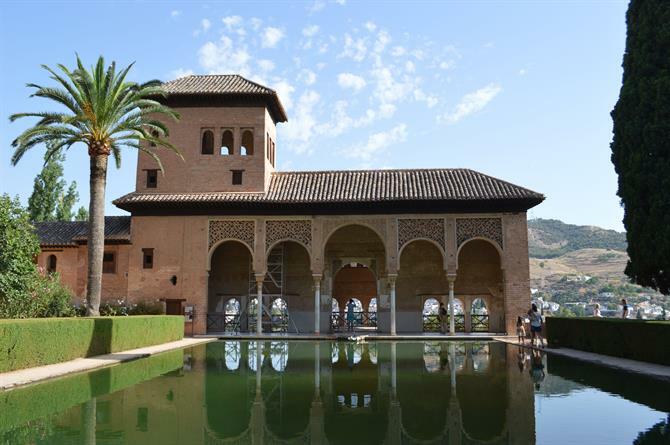 One of the rooms has been converted to the Alhambra Museum, while another is now a viewing room displaying remarkable photography of the palaces and grounds. I recommend visiting this viewing room, located up the stairs of the impressive amphitheatre. This much smaller palace doesn't require a lot of time to visit. 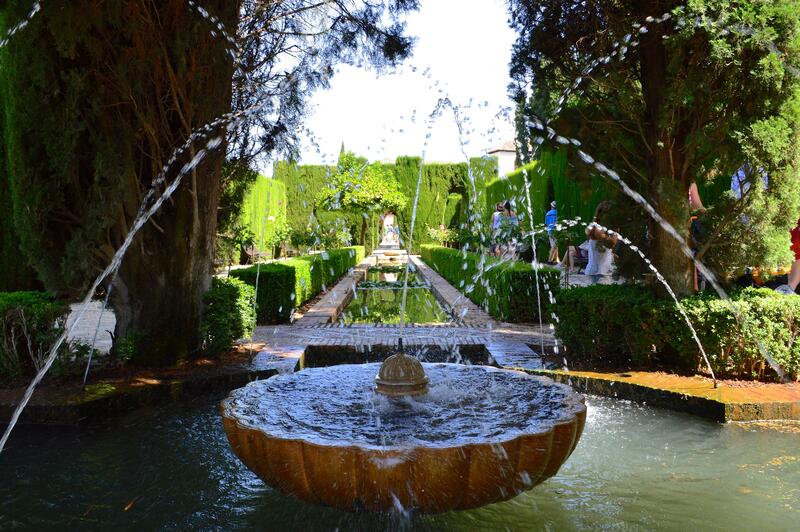 Finally, the lush gardens found just to the east of the Alhambra provided a peaceful oasis of shady areas and flowerbeds for the Arab kings and their families to use as a place of leisure and retreat. Not to be confused as being the Alhambra's gardens, Generalife actually has its own palace and residencies. 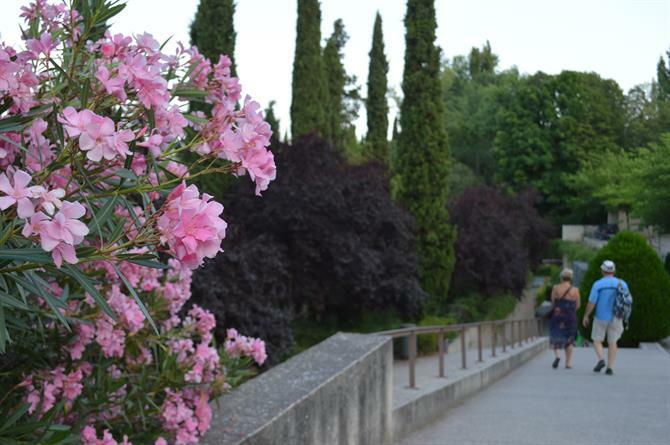 The name Generalife likely comes from the Arabic word Jannat al-'Arīf, meaning 'Garden of the Architect'. It's a vibrant and special place that will make you wish you had several hectares of land and a hired gardener for your own home. 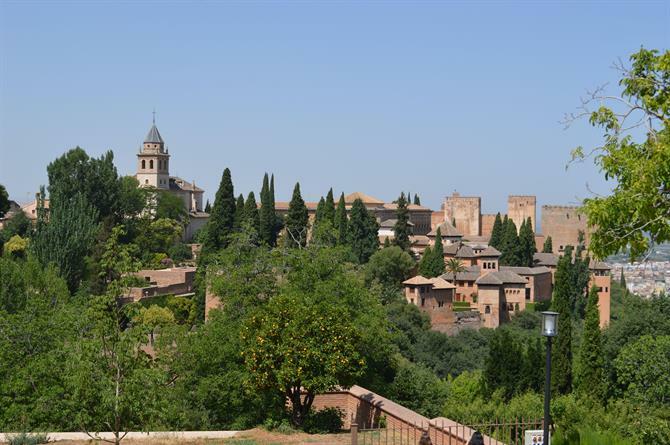 Typically, a visit to the Alhambra is broken down into these four areas: Nasrid Palaces, the Alcazaba, Carlos V Palace, and Generalife. Each can further be broken down into subsections, which you may read on websites or in guide books as "must-sees". Be sure to pick up a map from the entrance gate but keep in mind that the layout of the grounds is such that you will naturally stumble upon all of the iconic rooms and statues anyways (such as the baths, the towers, the lion statue, the Court of the Myrtles, and so on). There are frequent signs pointing the direction of continuation of the visit. As you go along, particular points of interest will strike you as particularly fascinating or historical! 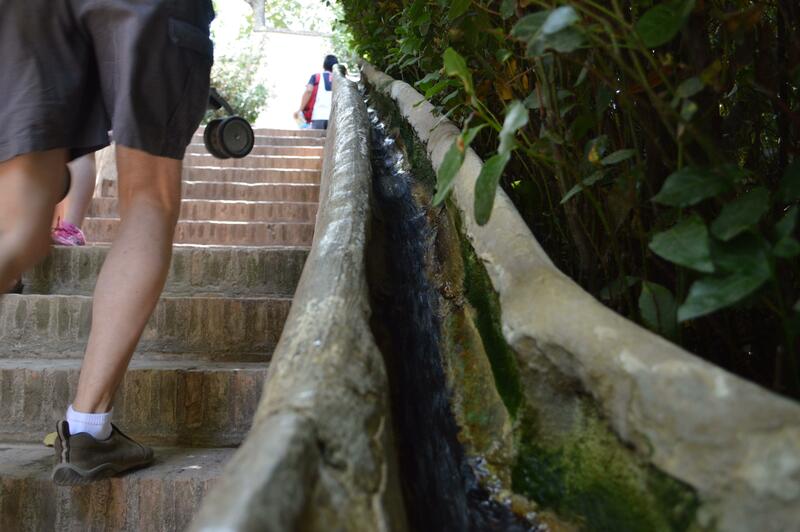 One of my favourites in Generalife was the Water Stairway. A long path ascends between trees and flowers, with two streams of water trickling down both sides. If you want to learn more about these smaller but still significant sections, you might consider reading an in-depth book on the Alhambra before your visit. While doing some research in advance of my visit, I noticed the abundance of sites which attempted to explain the ticketing process. I quickly became confused. After sifting through numerous sites offering sales and advice, I eventually purchased the tickets that I needed and discovered that the process does not have to be as complicated as it's made out to be. One thing is to be understood: tickets for the Alhambra should be booked in advance. I recommend booking a few weeks ahead of your intended visit so that you may have full choice in which time of day you would like to go. You can purchase online, by phone, and other options. See here for more details. That brings me to my next point: during the summer months, try and book your tickets during the morning. Granada is an inland city, which means temperatures often hit high 40s (centigrade) in July and August. During the rest of the year, daily temperatures are more moderate. Following from that, the ticket sale websites offer a multitude of ticket options. If you are there to see the entirety of the Alhambra, a general pass is what you need. This pass costs around €15. Other options include a night visit, entrance to limited areas, and specific tours. Morning ticket hours are from 8:30 am - 2:00 pm. Afternoon hours are from 2:00 pm - 8:00 pm. Entrance times to the Nasrid Palaces are scheduled every half hour. The box office opens slightly earlier at 8:00 am and also closes earlier at 7:00 pm. It is advised to enter the main gates before the time printed on your ticket. From here, the walk to the palaces takes about 10 to 15 minutes. Once inside the grounds, you will find a box office where you can collect tickets purchased online. Nearby, there is a small café bar with all sorts of snacks, small lunches, and of course coffee. 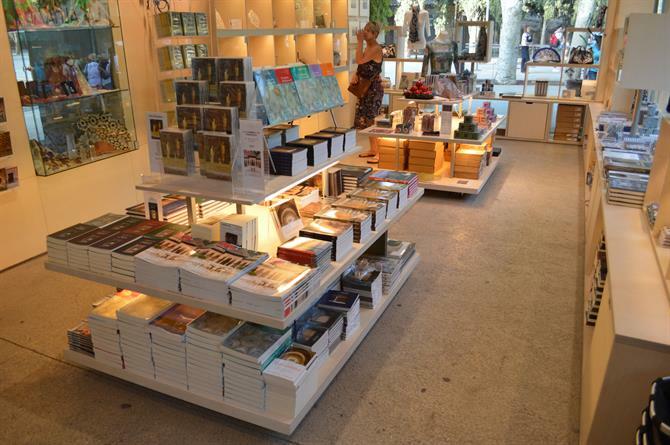 Across from this you will see the Alhambra gift shop where you can purchase comprehensive books about the monument's history, design, etc. as well as many other souvenirs. A little further on is the main box office, where visitors can purchase last-minute tickets and where you must scan your ticket to enter the site. Again, do so about 15 minutes before your scheduled entrance time to the Nasrid Palaces. Getting to the Alhambra is quite simple from anywhere in Granada. There are a couple of route options if you are driving from the center, but all will lead you to the parking lots at the top of the hill. There is also a bus that runs from the center of Granada, the C3, that takes passengers up to the Alhambra and stops at the ticket office. Taking a taxi or walking are also options. Consult the map at the bottom of this page. 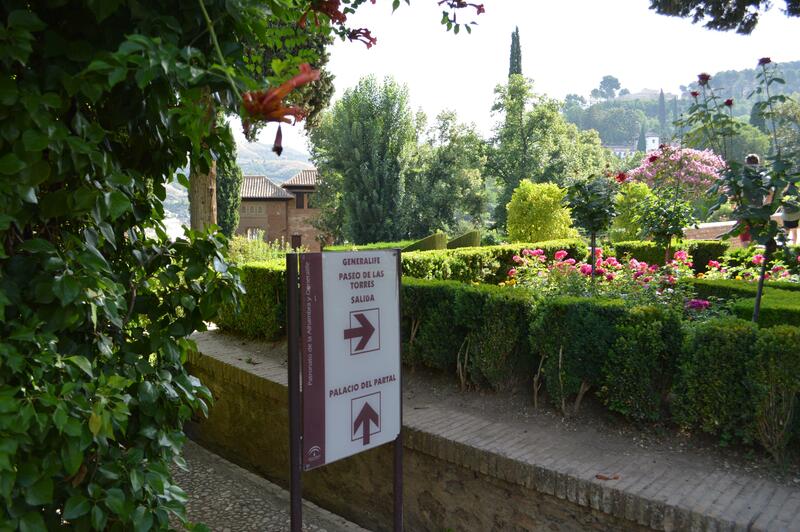 The surrounding barrios of Sacromonte and Al Albaicín offer incredible views of the Alhambra from below. Each has their own flare, gastronomy, and ambiance that should be experienced if you have more time to spend in the city. Don't forget that Granada is one of the last cities in Spain to honour the tradition of serving a free tapa with every drink! (Not all bars do this, but most). 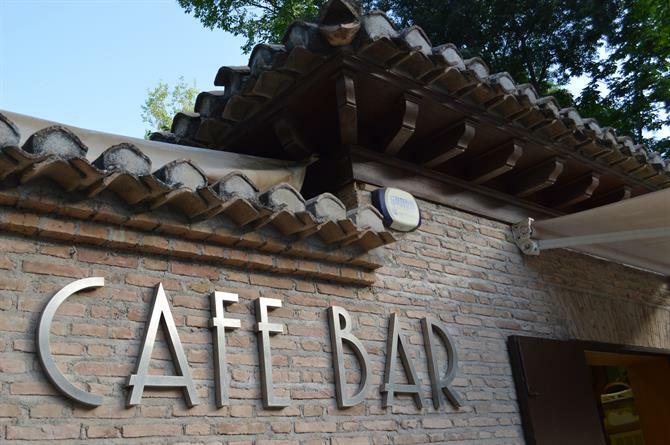 Check out some of Granada's best tapas bars after your visit to the Alhambra. For all other things Granada, including day-trips, museums, things to do on a summer's night, and more, see here. Enjoy your visit to this amazing historical monument and don't forget to charge up your camera battery the night before!